CACI-Non Surgical Face Lift visible results without surgery, anaesthetic or downtime. Award winning treatments with a huge celebrity following. CACI’s award winning facial treatments use the very latest pioneering technologies and have been voted the most effective anti-ageing treatments available. CACI Face Lift firms and tones sagging facial muscles and smoothes the appearance of fine lines and wrinkles. CACI's exclusive serum filled cotton buds enhance the dramatic tightening effects delivered by the dual tipped treatment probes. Supper CACI focuses on the facial muscles for longer, lifts and tones sagging facial muscles and smoothes the appearance of fine lines and wrinkles. CACI's exclusive serum filled cotton buds enhance the dramatic tightening effect deliver by the dual tipped treatment probes. The CACI Ultimate Lifts and tones sagging facial muscles and smoothes the appearance of fine lines and wrinkles combined with micro-dermabrassion and hydra-tone treatments to give the ultimate results for your CACI facial. 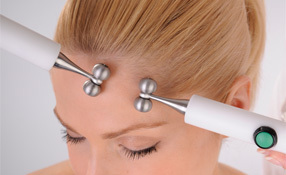 CACI's exclusive serum filled cotton buds enhance the dramatic tightening effects delivered by the dual tipped probes. "I’ve been having CACI now for two years, my facial muscle are more lifted and toned and my skin has a much more smoother appearance. I have CACI once a month with Kelly who is amazing and don’t think I could ever stop as I love the results CACI can achieve. I’ve had many comments from friends too which is always a great confidence boost." "For anyone looking for a treatment that makes a REAL difference, without any invasive or potentially harmful chemicals/procedures - CACI is the one!! I'm passionate about looking and feeling good, regardless of age... and I was thrilled when Fusion started to offer CACI treatments. Kelly, who is the main practitioner, is very experienced and skilful. In addition, she has a wonderful manner and you can't help relax and enjoy the sessions. I would recommend it to everyone who wants to make a difference to the tone and quality of their skin." CACI treatments use micro currents to re-educate facial muscles, lifting and toning the muscles using a tsunami wave form to achieve maximum results in toning facial contours. No CACI is not painful, its quite relaxing. How often do you need to have a CACI facial? To maintain maximum results from CACI you need a course of 10 treatments over five weeks to re-educate the muscle to stay toned and lifted. After the course of 10 you maintain the lift with a CACI facial every 4-6 weeks, your muscles will stay lifted until you stop having CACI. You can have a one off CACI facial for special occasions that will last up to four days. Will my facial muscles be worse after having CACI? No, your facial muscles will slowly go back to their normal state and will not be affected at all by CACI. Can I have CACI if I’ve had botox or filler? For clients who have had botox done in one or two areas (like the forehead and crows feet near the eyes) please be advised the technician will have to work around those areas. If you have had botox in more than two areas and it has been less than 3 months ago, please be advised your appointment may have to be re-scheduled until the three months have passed.